Your Go To Guide to Family Fun Events and Information in Lexington and Central KY! 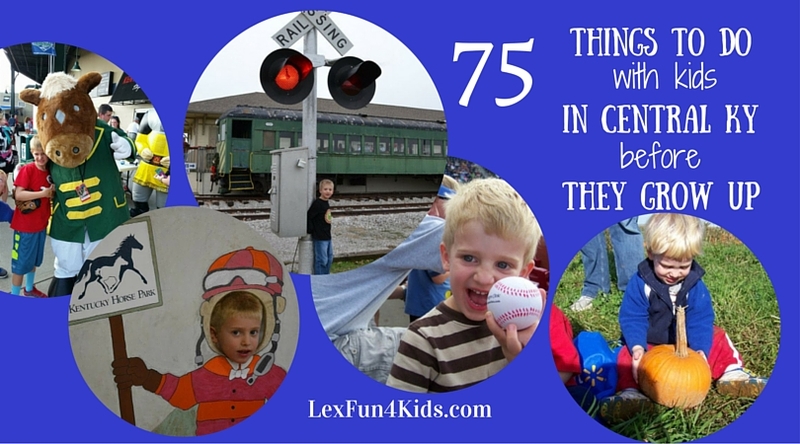 There are family fun events and things to do for all ages in Lexington and Central KY. Here’s a list of 75 great activities in Central KY that every kid should do before they grow up! Visit McConnell Springs, the Birthplace of Lexington. Founders’ Day in May is a great way to see history up close. Take in the sights and sounds of Keeneland during a meet or for a special event. Enjoy the beauty of Shaker Village of Pleasant Hill. Cheer on the University of Kentucky Wildcats at a sporting event. Enjoy a show at the Lexington Children’s Theatre. Taste local foods at the Lexington Farmer’s Market. Go to the Kentucky Horse Park and see the Derby trophies, go on a horse drawn carriage ride, and see famous racehorses. Hats Off Day is FREE each year. Enjoy a spring festival or parade for St. Patrick’s Day, KiteFest, MayFest or Founders’ Day. Get spooked at Little Goblins Galore, a local pumpkin patch, or the Thriller Parade. Take in the lights at Southern Lights at the Kentucky Horse Park for the holidays. Learn about the “Paul Revere of the South” at the Jack Jouett House – many events are free. Learn something new at the Living Arts and Science Center. Discovery Nights are held monthly and are just $2 (suggested donation). Explore the Kentucky Children’s Garden. Get FREE admission during some special events each year. Step back in time with a visit to Fort Boonesborough. Walk the path at the Arboretum and stop by their fish pond and garden. Cheer on the local minor league baseball team, the Lexington Legends. Join their Kids Club and kids get FREE admission on Sundays. Support the arts and enjoy Gallery Hop held throughout the year. Appreciate some jazz at Ecton Park or Moondance Amphitheater. See the stars at the Hummel Planetarium or go Stargazing at Raven Run. Tour the Toyota Plant in Georgetown – it’s FREE! Experience a reenactment with the Settlement and Raid event at Fort Harrod or Fort Boonesborough. Take a pedal boat ride at Jacobson Park. Visit the University of Kentucky Art Museum – it’s FREE and they offer Family Fun Sunday events. Taste Old Kentucky Chocolates – the tour is FREE! Go to Cumberland Falls, plan a visit to see a Moonbow. Enjoy a cold Ale – 8 – 1 – tour the plant for free in Winchester and get one FREE after your visit. Enjoy a Free Friday Flick at Jacobson Park in the summer or a Fountain Film at Triangle Park. Summer Movie Events are held each year. Bike the Legacy Trail or enjoy Bike Lexington this May. Listen to some Bluegrass music at the Festival of the Bluegrass. Take a train ride through the bluegrass on the Bluegrass Railway Museum. Try a ropes course at the Life Adventure Center. Zipline the Red River Gorge. Taste a Kentucky favorite – Beer Cheese! The Beer Cheese Festival is held each June in Winchester. Raise money for homeless kids in Central KY through LemonAiD Days from the Salvation Army. Visit a County Fair in your community. Canoe through our local waterways with Canoe KY. Enjoy local music at Thursday Night Live. Play at local parks, try visiting lots of different ones! Get wet at a local Aquatic Center. Learn more about Mary Todd Lincoln with a visit to her former home – right in downtown Lexington! Free for kids K – 12th grade each Presidents’ Day. Try a new restaurant and enjoy a great deal with a local Kids Eat Free (or cheap) Night! See locally made arts and crafts at the Kentucky Artisan Center in Berea. Visit the State Capitol building – they offer FREE tours. Listen to the Lexington Philharmonic – they offer hands on Instrument Petting Zoos and kids programming all year long. Meet a retired racehorse at Old Friends Farm. Stop by the Aviation Museum of Kentucky. See a show at the Lexington Opera House. The Lexington Children’s Theatre, Broadway Live!, local dance groups, and many others offer performances year round. Learn about bison and how they roamed our area years ago at Blackfish Bison Ranch in Winchester. Read with your family at a local public library. Summer reading programs offer special programming and prizes. See Santa and the Christmas Tree Lighting in Downtown Lexington. Have tea, see the tree lighting, or take a tour of Ashland, the Henry Clay Estate. Spend the night at a local zoo or museum. See how Louisville Sluggers are made at the Slugger Museum in Louisville. Strike up the band at the Great American Brass Band Festival in Danville. Ride the Dixie Belle Riverboat. Shop the 127 Yard Sale in August. Go sledding at one of the best hills in town. Help Reforest the Bluegrass and plant a tree. Lace up your skates and try the outdoor ice rink in Triangle Park in the winter or the Lexington Ice Center. Enjoy a national festival, Breyerfest, that is held at the KY Horse Park each summer. Do something unique and visit the Dollhouse Museum in Danville. Attend a family friendly show at the EKU Center for the Arts. Zip line across Rupp Arena at the annual Kentucky Sport, Boat and Recreation Show. See a movie at the Kentucky Theatre, a beautifully decorated theatre in downtown Lexington that opened in 1922. Visit a locally owned bookstore for storytime. Enjoy a Woodsongs Radio Hour live performance. See a movie at the Judy Drive In. Visit Parkette Drive In for a Poor Boy or Chicken Box. Try geocaching at a Ky State Park. Go see the Stephen Foster Story in Bardstown. © 2012 - 2019 Lex Fun 4 Kids, LLC All Rights Reserved.